In coming weeks we will witness the release of 3 mega budget movies of Bollywood’s superstars. First to release will be Salman Khan Starrer Yuvraj, then Shahrukh Khan Starrer Rab Ne Banadi Jodi, and finally Aamir Khan Starrer Ghajini. Although they are not releasing on the same day, they are sure to disturb each other’s box office collections. All three come with mega hype. Yuvraj – Salman and Katrina pairing, Subhash Ghai’s direction and A R Rahman’s music. Rab Ne Bandi Jodi – DDLJ team, Shahrukh Khan and Aditya Chopra, come together after a long gap of 7 years. And debut of new find Anushka Sharma. Ghajini – Any movie with Aamir as the lead causes hype, and this movie is no exception. And add A R Rahman’s music and debut of southern sensation Asin. According to what I see in promos, and the history of stars and crew involved in these movies, I can safely say that Rab Ne Banadi Jodi will win the race. Ghajini too will do well, but not as good as Rab Ne Banadi Jodi because action movies don’t do that well in Bollywood. Yuvraj will face an uphill task as Salman Khan, Zayed Khan and Anil Kapoor are not happening these days. The only saving grace is Katrina Kaif. 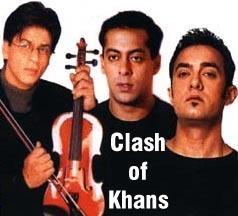 Will Aamir Destroy SRK at the Box Office?